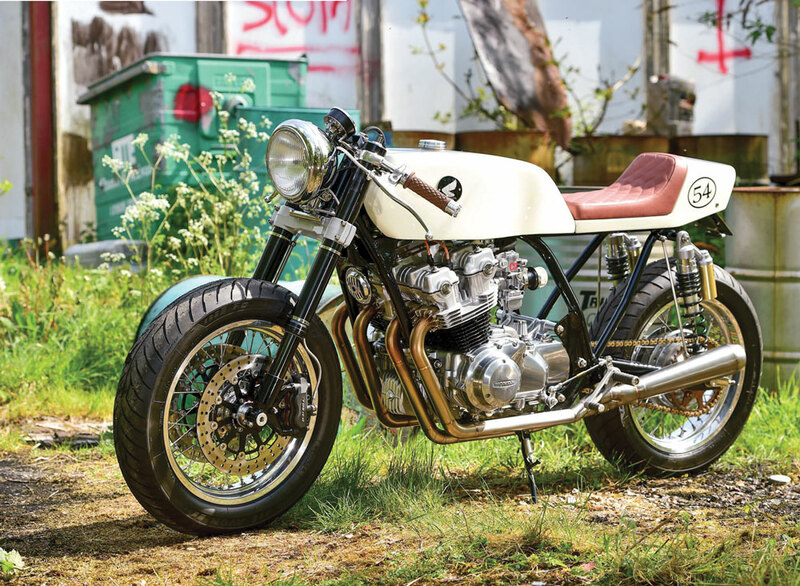 before he is happy with it, so it’s no surprise that his cafe racer, which started out as a 1979 Honda CB75KZ US import, looks so neat. 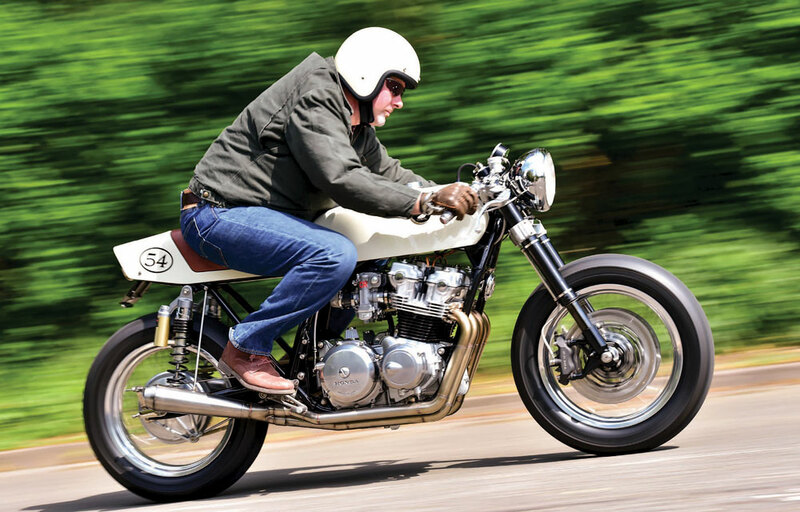 Dave bought the bike several years ago, from an eBay non-runner sale for the sum of £281 (or about $350 U.S.) He started reading magazines and studying cafe racers, recalling that he found in almost all of them something lacking, and that he had other ideas of how he would have built them. 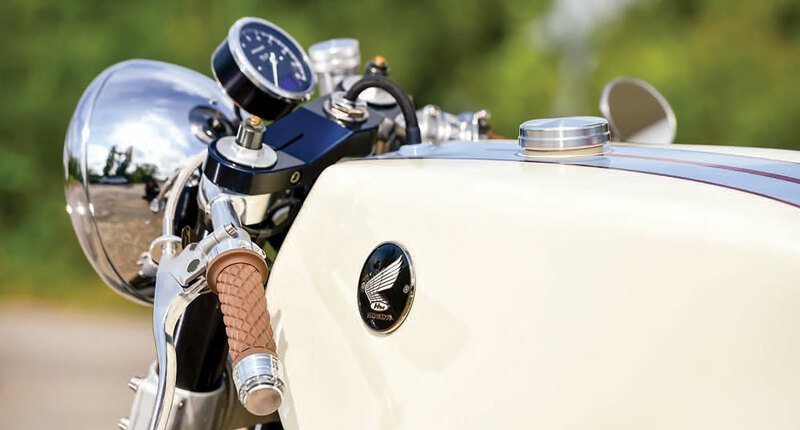 But there comes a time when you have to walk the walk, and so with a number of ideas in his mind’s eye, the creation of the CB Cafe Racer 54 began. As a sixteen year old, and despite his dad’s hatred of motorcycles, against his wishes, Dave saved up for a 50cc moped. A couple of accidents occurred, but no major injuries. At seventeen he wanted a proper bike, a Kawasaki 250 Triple, but was persuaded by the “Bank of Dad” to buy a car. He needed transport so had no alternative other than to accept, but as soon as he was able, he was back on two wheels and has not been without a bike since. “I have raced them, instructed others how to ride on the road and track, and now I build them,” Dave said. “It’s in my blood and I can’t resist their calling. One of the most important things to me on this bike is that I made, welded, painted and designed almost everything myself. Anything that is from Honda has my mark on it. I had some help, but 95% is my own work. I think that if you build a bike, it needs to come with the desire to make it personal. “This machine has been so well received at various custom shows, and I love talking to those who have tried to do stuff to make a bike their own, doing what they can with what they have. I am often being asked if I do it for a living. Maybe I should think about it, as I have enjoyed building this one. It’s won awards, but the real truth starts with my next project. I have a 1982 Yamaha XV920 (TR1) waiting in the wings. Apart from it being a God awful ugly motorcycle, many cafe racers have been built using this model as a donor, so I will have my work cut out to make it something special. “Having said that, it is not cheap building a bike to this standard. 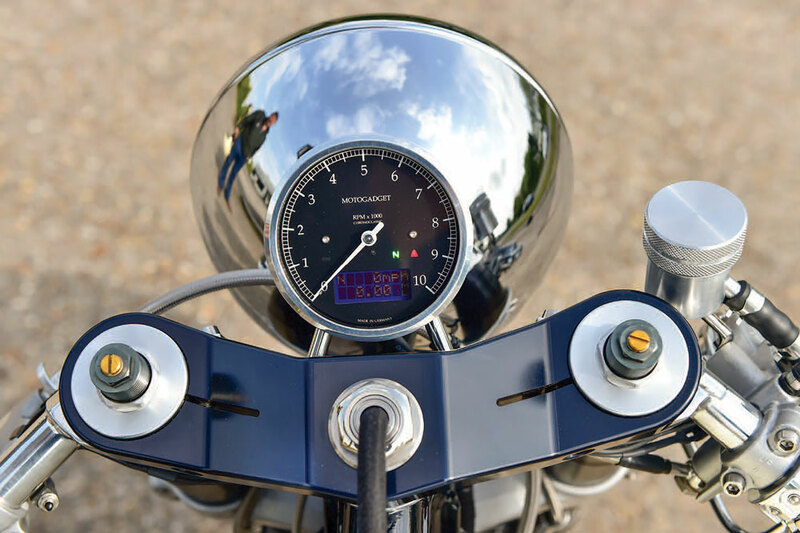 The rev counter, bar- end indicators and central electric control unit cost close to £1000. On top of that you’ve got wheels, tyres, paintwork, suspension, engine rebuild, fabrication materials etc.,” said Dave. With several predetermined criteria in mind – huge headlight, long 60s-style Honda race tank, short narrow rear seat and seat unit, drop bars, up-to date forks, brakes and rear shock units, wider wheel and tyre combo – and still with the flavour of “Old School”, equal sized tyres that hark back to the early stripped down Harley bobber look, minimal and reliable electrics and everything possible made from stainless steel, Dave set to work. The engine is completely standard, apart from the removal of the rev counter cable drive hole in the cam cover, which was a mission involving two cam covers and a lot of fabrication work. Looking for a fairly standard and clean factory look for the motor, the engine was stripped down, and all wearable parts were vapour blasted, painted and powder coated. Although the original carburettors were in a serviceable condition, they did not have the cool look Dave was after, so 29mm Keihin CR29 carbs were sourced from the States. Given the throttle response and the intake noise, just magic, the £550 price tag seems well spent. 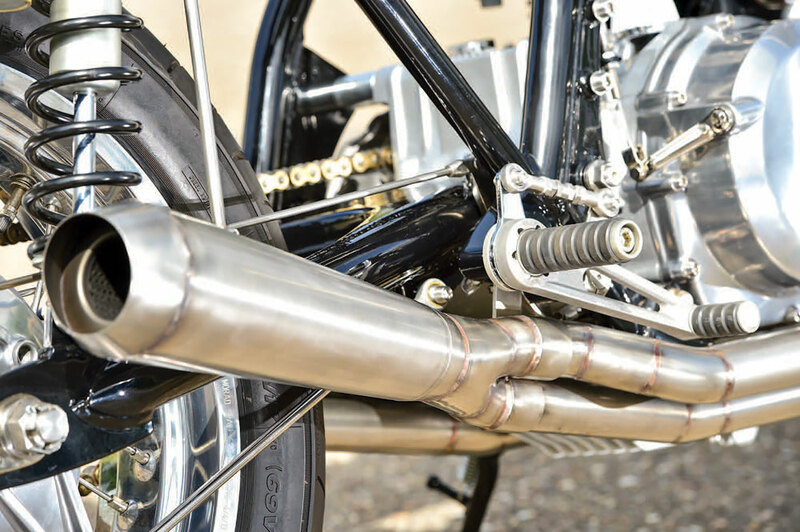 “The area behind the carbs needed to be clear, no air-box or mudguard, but I needed something to safeguard the intakes against stones and debris thrown up by the rear tyre, so keeping with the minimalistic theme, I fabricated a set of stainless steel mesh filters with a slightly different look to the standard type. 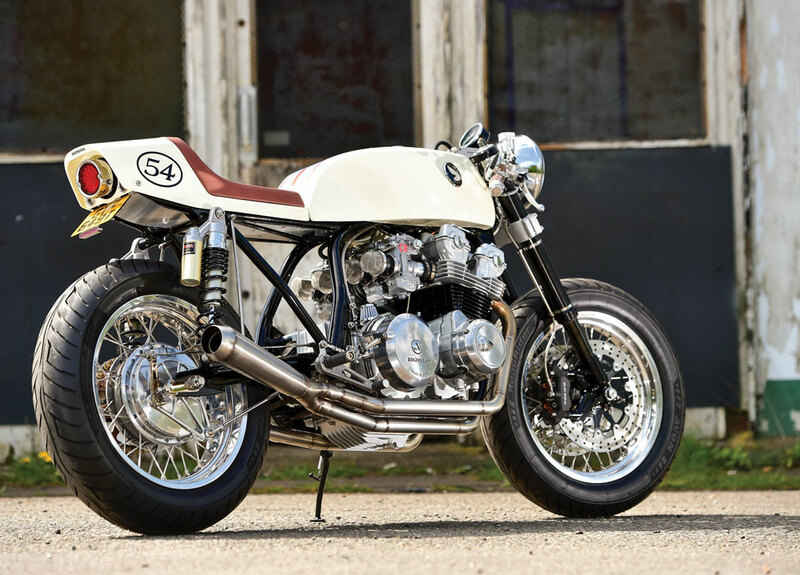 I think that a cafe racer needs to have that space behind the engine and carbs, but everyone to their own taste I guess,” Dave said with a laugh. With cracked and corroded coils, the standard ignition system was in a shocking state. Oozing black grunge and probably about forty years old, they were replaced by remanufactured and updated CDI units and Dyna coils, new HT leads, caps and plugs. Interestingly, all that which was junked actually worked, briefly, as the bike was run before it was stripped down. The frame has undergone a lot of work. Noting that the later Honda DOHC model bikes are quite difficult to get that straight line through the underside of the tank and seat unit, in his opinion, a necessary exercise when aiming for that cafe racer look, Dave more or less cut the rear frame off and fabricated new. The work done to the front of the frame included permanently welding in the originally removable right-hand cradle to increase rigidity and improve the aesthetics. This involved stripping the top engine of the motor to remove the whole engine. A small price to pay for a “factory” look, finishing with lacquered powder coat in black. Foot controls were taken care of with Tarozzi Cafe Racer rear sets, as they looked like what Honda may have used back in the day.The rear brake operating lever at the brake drum end was changed to sit facing upwards, which entailed fabricating all the footrest end operating levers to suit. Still following that factory look, the forks and lower triple-tree are from a 2006 Kawasaki ZX10R, chosen because Dave wanted the fork legs to be black the whole way down. The brake callipers and discs are also ZX10R, as is the master cylinder, though the finish has been changed trying to maintain a period cafe racer look. Dave enthused, “The top triple tree was custom machined by a friend, John Burt. It is always hard to fit up-to-date forks’ suspension to older bikes because of a ground clearance issue. My way on this was to drop the forks, which meant using a down-stepped top yoke. I used the front wheel hub from a Yamaha XS650 that was machined to accept ZX10R discs. The brake lines are braided stainless steel, with bespoke mounting brackets. Grips are brown trimmed down Biltwell Thruster to match the seat. Worried that he would have problems getting the extra wide rear tyre and wheel combination into the more-or-less stock swinging-arm, it looks like it grew there.The wheels are custom built alloy rimmed, using stainless steel spokes: front 3.5” x 17; rear 5” x 17. Both are Avon Roadrider. 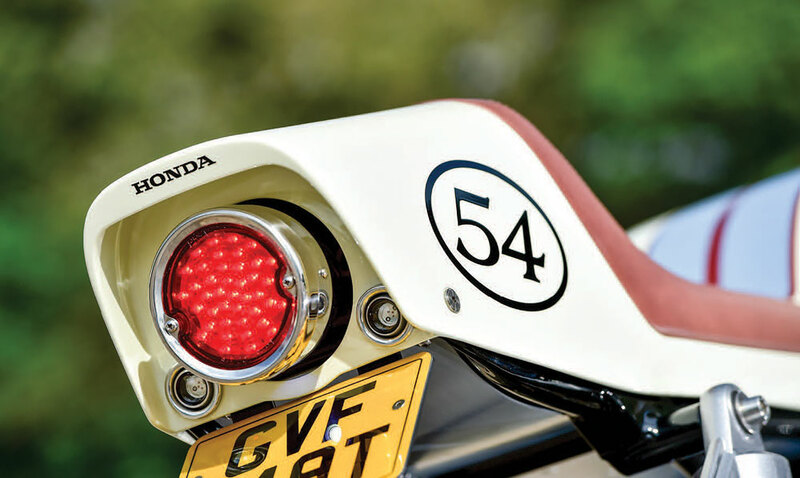 A flavour of the 60s Honda race tank was called for, really long, but wide enough to suit the proportions of the motor. Having looked far and wide to no avail, an alloy race tank minus its fuel cap and mounting points was sourced from eBay for £30. It was so wrong, that Dave ended up cutting out the underside, and making something that would fit the frame. To get that 60s styling, it was lengthened by four inches. To complement the lines of the tank, the seat unit had to be fairly angular, slim and short, to again mirror the Honda race bikes. But as with all parts in his mind’s eye, there was nothing on the market that fitted the bill for Dave, so another learning curve ensued. After many attempts he came up with a shape and style he liked. No fan of flimsy glass fibre, the seat unit is 5mm thick, giving a great base to work with. Feeling pleased with the outcome, he also made the seat pan to the same thickness. The seat was then upholstered, elsewhere, in tan diamond-stitched leather. Reflecting the era, the main paintwork had to be a creamy old English white, which actually turned out to be the American Ford colour of Crème Brule. The graphics had to be along the lines of the Cobras of the time, Gulf racing colours, and the cool grey and blue used on some of the VW buses and Beetles – this was Dave’s take on it. He carried the painting out in his garage, but remembers what a nightmare it was, with the graphics looking like an eight year old had produced them. The sheer frustration and time spent on this almost put an end to the whole project, but his patience and determination won through. Dave stressed, “I hate wires! I tried to minimise this aspect as best I could. The battery is a gel type, and sits on its side at a slight angle in the tail section, which also houses the starter relay and main fuse. Below the seat, in the thinner section of the unit is a MotoGadget M-Unit, which in conjunction with the M-Button, is a must if you want to cut down on wiring. Despite throwing away fifty percent of the original bike, Dave describes it as a bit top heavy and slow steering compared to today’s machines, but still handles very well, with an exhaust note true to form – loud, pops and bangs on the over run, like a real 70s/80s race sound. Thanks go to John Burt, who made the top yolk, and Paul Meader, who helped with the paint for this project. And I think that Dave’s partner Michelle also deserves a big thumbs up, as she lets him keep it in the house.